As often happens when you’re wandering around a tourist resort or attraction, you are approached and asked if you wouldn’t mind taking a photograph for somebody. 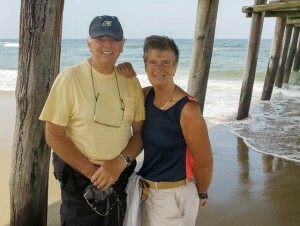 Today was no different as we walked along the beach at the Little Island Park, Sandbridge just south of Virginia Beach. 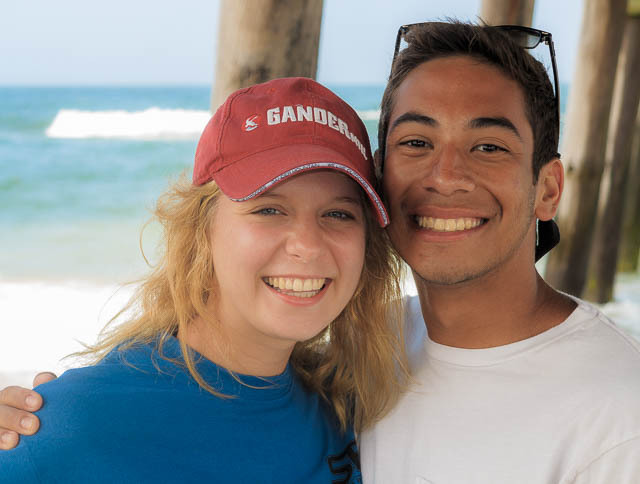 A charming young couple, Rico and Brooke, were taking pictures of each other beneath the fishing pier and asked if we could take a picture of them both. Lorna was only too pleased to oblige and took a couple of photos with Rico’s iPhone. I wanted to know if there was a flash on the ‘phone and could he please turn it on. Rico laughed and asked why on earth would you want to use flash when it was bright daylight. Well, that was the wrong question to ask because what should have been a moment to take a picture turned in to a fifteen minute tutorial on the use of fill-in flash. The young couple were good sports and took it all in good fun. We wish them both the best with their studies. yup, I can hear the tutorial now…! ha, ha! You never stop teaching! Good on you, Pat! Great photos, and it looks lovely and warm there. Still cool and wet here on PEI, but lots of things going on so we’re doing fine! Cheers! Patrick and Lorna, thank you for having kind souls and taking the time to share a bit of your lives with us. We wish you the best on your travels and will continue to keep up with your blog. It was a pleasure meeting you, if you are ever in Newport News VA, stop by our amazing Univeristy, Christopher Newport Univeristy. Best of luck in all of your endeavors and thanks for the life and camera lessons. Hello and good wishes from sunny spain.Please continue with your blogs. Lynne and Ray. Good to see you are still taking photos!!!! Me too!! Am currently working on a book to celebrate 20 years of wedded bliss!!! Come back and see us soon! You two look great! Yes, I can hear the lecture–hopefully they learned something from it, eh? Glad to see that you two are making the most of that extra six months you got. See you are still having fun. Just had knees done so off work with feet up.